Stressed, tired, or just craving a bit of respite? Wild Honey Coffee & Tea Boutique is here to save the day. While the spot itself is bit tricky to find, visitors can call ahead and the English-speaking staff will kindly direct you. Once there, settle into one of their cushy lounge chairs, peruse one of their English magazines and sip one of their finest teas. 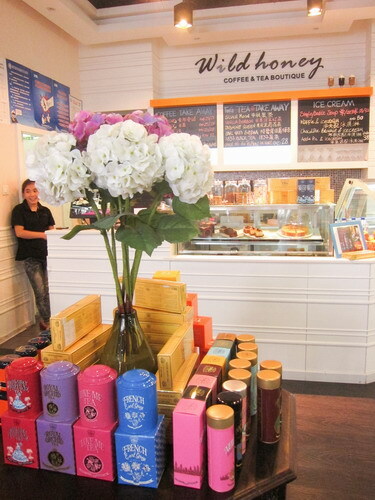 As the exclusive carriers of two imported brands of tea, Wild Honey offers T2 from Australia and TWG from Singapore. Types of T2 tea include relax, detox and refresh. TWG uses only high quality loose leaves, even in their tea bags. With teas grown around the world, TWG’s collection is vast, ranging from red (roobis), white and black to green and blue. There are hundreds of tea blends to suit any palate. The caffeine-free red teas are suitable for children and pregnant women. And if you want to continue brewing at home, these teas are also for sale. For 100g, T2 is sold for about RMB 148. TWG sells for RMB 128 (50g) and RMB 228 (100g). Both T2 and TWG can be kept for up to three years, if kept in an air tight container. And of course, there is honey. They have New Zealand Honey Co. and the health conscious can opt for Bio Active honey, which is loaded with anti-oxidants. There is also honey cordials, which can soothe a scratchy throat when warmed. In addition to tea, Wild Honey offers a great selection of food: soups, salads, pizzas and pastas. 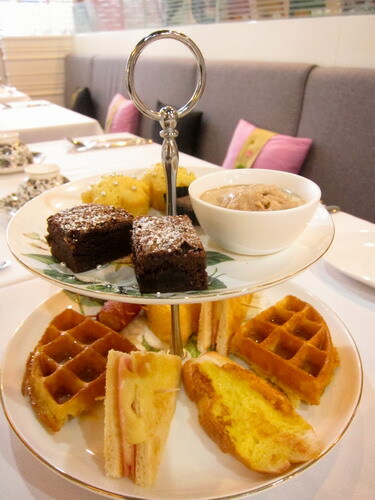 Kids will love their Belgian waffes with ice cream (RMB 50). And they’ll also be happy to know that brunch items are served all day. But the prize winner here are the tea sets. The Alice in Wonderland Tea Party Set is perfect for kids. Made for two, it includes a pot of non-caffeinated tea (either a roobis or fruit tea), brownies, finger sandwiches, gelato – all for RMB 88. Older kids and adults will also love the Chocolate Fondue Tea Set (RMB 68) for two, which comes with fruit and marshmallows to dip, as well as a TWG Lemon Bush tea. For the sweet tooth, there are also cupcakes from CC Sweets. Classic ones are RMB 20, while mini-cupcakes cost RMB 12. And top everything off with a scoop or two of gelato from Australia. Choose from mouth-watering chocolate, caramel, honey, strawberry, raspberry, mango and coffee. The selection doesn’t stop there either. There is also chai tea (RMB 28) and summer tea sangria – with or without alcohol (RMB 58, RMB 48). Wild Honey’s very first customer is a mother of two girls, ages 10 and 12. She remains a loyal customer, and is also always sure to try the newest item on the menu. Her testament and loyalty to the boutique is telling of the quality and service of this quaint café and shop. First comers are sure to return. I know I will.